The Nozawa Onsen Ski School offers a variety of lessons and activities throughout the Ski Season ranging from general ski and snowboard, kids' and private lessons to snow shoeing tours and camps. Whether it is intense one-on-one training with a professional coach or you're just looking to enjoy the scenic trails, there's something available for all ages. Ski and snowboarding classes are held every day on a regular basis ranging from beginners to advanced lessons. Full day lessons as well as morning and afternoon half day lessons are available. 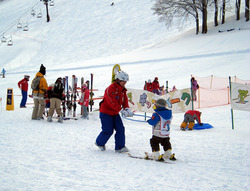 Enrolments are done on the day of the lessons during reception times at the Nozawa Ski School desk. Classes will be divided according to experience and technical skills and, as such as, the lesson plans will change depending on the classes. 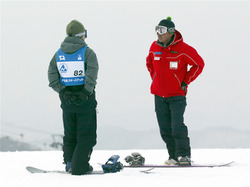 For further details, please refer to the Nozawa onsen Ski School website. *Prices : 4,000yen per person. *Prices : 3,000yen per person. The Nozawa onsen Ski School also offers discounts for a full day lift and lesson package. Only available with the general adults lessons for ski and snowboarding, a full day lift pass will be included in a full day lesson for a total of 7,500yen. Please go to the Ski School front desk during their reception times. Please note that the class lessons are predominantly in Japanese and there are no guarantees for English speaking staff. Please refer to the Private Lesson for it. Whether it is for a family, a school class, a club or even for business groups, the Nozawa onsen Ski School also provides qualified instructors for private lessons. As English speaking instructors are in limited supply, early reservations are recommended in order to secure your lessons. We are happy to ask them and make a reservation instead of you. Please provide us with the followings.